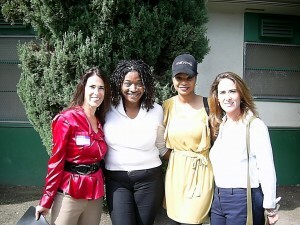 Los Angeles, CA: Beyond Bullies participated in the Beverly Hills / Hollywood NAACP Teen Domestic Violence Summit, "Stop the Bullying" campaign on October 21, 2011 at Dorsey High School/ The NAACP TEEN SUMMIT is sponsored by Verizon. Bullying is a form of abuse. Bullying behavior is often rooted in a would-be bully's inability to empathize and connect with others. It may manifest as violence due to internal turmoil. There are many forms of Bullying ranging from one on one contact, to one or more 'lieutenants' willing to assist a primary Bully. Cyber-Bullying is the use of the Internet and related technologies to harm other people, in a deliberate and hostile manner. There will be Celebrity performances by The Rej3cts and J McCoy. Hosts for the Teen Summit are: Quinton Aaron (The Blind Side), Ray J (R&B Artist/Actor), and Hill Harper (Actor/CSI NY) who is also addressing Teen Domestic Violence Stop the Bullying Teen Summit Ambassador. Other Celebrity Talent will include Porsche Coleman, Mario Van Peebles, Laura Goven, Lamorne Morris, Brandon T Jackson, and many more! Addressing Teen Domestic Violence Stop the Bullying Summit will travel throughout the US supporting teens exposed to life-threatening situations. The launch is Friday, October 21, 2011 at 10:00am at Dorsey High School. Addressing Teen Domestic Violence Stop the Bullying Summit is supported by LAUSD Board of Educators. The goal and role of the NAACP is to act as a liaison between LAUSD along with mental health providers to develop ongoing programs addressing mental health needs. The NAACP is raising awareness for Teen Domestic Violence and other forms of violence touching the lives of youth, by stepping its efforts up to promote healthy learning in LA schools. Bullying affects children and their elders in every nationality. It's time to take a stand for sake of the precious children of today, and the children of future generations.